Bootstrappers have to figure out how to market via the web. It’s the lowest cost, lowest friction, highest leverage medium available to get the word out. And, it is the easiest place to collect metrics so your decision making can be informed rather than just seat of the pants. But there are many dangers with metrics. First and foremost is optimizing the wrong one. – Facebook trumps all the other Social Media by a large amount with 68% of referrals. Twitter only gets 25% and LinkedIn 4%. Translation: Bet hugely on Facebook, maybe experiment a little with Twitter and LinkedIn, but ignore the rest. – Of the Social bookmarkers, Stumbleupon gets 51%, Digg 30%, YCombinator 12%, and the rest is noise. So, we need to bet on Stumbleupon with a little follow up on Digg. – Google is delivering 92% of search referrals. Guess we won’t worry about anyone else there. – Media site referrals are 84% YouTube. Hey, Larry, we better get going on some videos! What’s wrong with that marketing plan? It’s backed up by well-researched numbers. The statistics are compelling. How can we lose? The answer, as in so many similar cases, is we may have optimized the wrong variable. It’s reasonable to assume that you want to get new traffic to your site in order to sell more product. After all, if prospects don’t know your better mousetrap exists, its hard to beat a path to your door. And these various venues are only too happy to help. In fact, Google would love to send clicks your way for just a small fee. However, even if all visits were created equal, we have no idea what the relative sizes of each pool are. So what if YouTube is 84% of media referrals if media referrals turn out to only be 1% of overall referrals? Worse, all visits are not created equal. Look at the YCombinator number as just one example. I don’t mean to pick on YCombinator, but go take a look at it. It’s a very specialized audience. Clearly they can swing that audience to go look at something in droves. But is your product really going to benefit from that audience’s interest? What will be the symptoms of making a mistake there? Well, you might successfully capture a bunch of referrals from YCombinator only to find that they bounce as soon as they hit your site. Yes, your content cleverly got them to click, but your product’s substance couldn’t cash the check you’d just written with your clever content. I’ll give another hint. The article suggests Stumbleupon may be an awesome place to focus some attention. I get a fair amount of referrals from Stumbleupon, and I’m not even trying, so I’m not surprised they show up well in a study like this. It was the #7 source of referral traffic, in fact. There is just one problem with focusing on it. When I checked this morning, Google Analytics tells me that it had a 96.9% bounce rate. The traffic arrives, doesn’t like what it sees, and leaves immediately. Average time on site is 49 seconds, versus a site-wide average of nearly 4 minutes. Maybe, with some effort, I can redirect Stumbleupon to do a better job. But, if I’m just looking at the raw referral number, I have optimized the wrong metric. I need to look at something else that gets closer to what I am trying to achieve. So what metric should we be optimizing? I’m a huge fan of closed loop marketing. I want to be able to track a lead, let’s call that lead a visit to my site, all the way through to a purchase. I want to understand that path as well as I can, from source all the way to revenue. I want to assign costs, volumes, and conversion rates to these sources and tie the effects of my changes in marketing back to their impact on these variables. It’s a lofty goal, but it’s the only way to know what’s working. If you optimize the wrong variable, you’re in for a potentially very expensive mistake either in opportunity cost for having worked on the wrong thing, or in real cash if you’re paying for clicks that didn’t translate into sales. Google Analytics will do a good job tracking where people who come to your site came from. It knows what pages they land on and where they go from there. Your job is to make the act of landing on a page correspond to the metric you want to measure. Let’s say you want to track people buying your software. Perhaps there is a page you could create that people only go to if they bought the software. It isn’t reachable in any other way. Maybe it is a Welcome page, or a page that activates their product, or better a page that confirms activation. Make that a Goal page and you’re ready to work backwards to analyze your funnel. You probably want to differentiate content that attracts people to your site and facilitates SEO from the actual page where you pitch your customers to buy the product. Perhaps there is a trial close along the way where customers sign up for a free trial. So on and so forth. Once you start analyzing these patterns, you’ll come to understand what really works for your world. Tie up Google Analytics to Google Adwords and you get an even more powerful analytics combination. You start to understand the impact and interplay of keywords, ad copy, traffic sources, and even factors like time of day, geographic region, or languages. I’ll have more to say about how to use these and other tools over time as I write more about bootstrapping. Some will argue that its impossible to get these metrics, so we shouldn’t worry about it. I couldn’t disagree more. The Internet makes it easier than ever before. Marketing is Tragically Knowable. I will always remember that phrase from my mentor, and co-founder of Netflix, Marc Randolph. Working through these kinds of metrics and conducting the A/B experiments to know what works better is all part of avoiding the “Tragic” part of “Tragically Knowable.” Tragic is when you think you know, whether by incomplete information, optimizing the wrong metric, or just going by gut, you make a big bet on it, and it turns out to be wrong. To avoid the Tragedy, make sure you understand how each factor you’re trying to optimize feeds your ultimate goal of selling product. Don’t optimize the wrong metric. Software developers say that premature optimizing is the root of all evil in software. Optimizing the wrong metric may be the root of all evil in marketing. Links to the Bootstrappa’s Paradise blog series as well as other useful resources for Bootstrappers. I had lunch with an old friend recently who does Angel investing. As sometimes happens, I launched into our lunchtime discussion with a bit of controversy by suggesting that I wasn’t too sure what the value of Angel was for many companies. After a bit of calibration on where I was coming from, we quickly converged to agreement. Any company that takes Angel is on the road to being a VC funded company. Companies that are never going to be good VC opportunities therefore shouldn’t take Angel. Angel is not really a “VC-Lite” substitute, its more “VC-Seed”. This post isn’t really about Angels, it’s about the interplay of Capital, Startup Ideas, and Entrepreneurs. To succeed, you have to understand how to balance all three along one of the successful paths. Leaving the path will very likely make your venture unsuccessful for lack of capital. The VC World has gone through a fascinating transition over time. I’ve done 5 startups now, and not one of them could’ve started up in the way they did today. The reason is that with few exceptions, it’s no longer possible to get funded with a slideshow and a team. Ironically, as VC’s were deciding that its much cheaper to start companies, they apparently decided that this makes it possible for companies to start themselves via bootstrapping. Yes, there are seeds and super-seeds, but even these typically require a product and some semblance of customers to get funded. Talking to entrepreneurs, it’s also not clear that the equity dilution and the terms offered them are better than the old days. In many ways they are worse, because they’re very tilted towards forcing a VC’s preferred outcome: creation of at least $1 billion in value. What are the ramifications of all this for entrepreneurs? First, I am not one of those who wants to argue that VC is bad and should be avoided at all cost. There are plenty of them out there, but so far as I can tell, no more now than there ever were. I’ve made a lot of money working with VC’s, I understand how that world works, and I frankly don’t have a problem with it. Keep in mind the VC’s are in business to deliver a return to their Investors. They’re going to conduct that business in whatever way they need to in order to deliver that result, just as any entrepreneur will do what it takes to keep their startup alive and hopefully thriving. 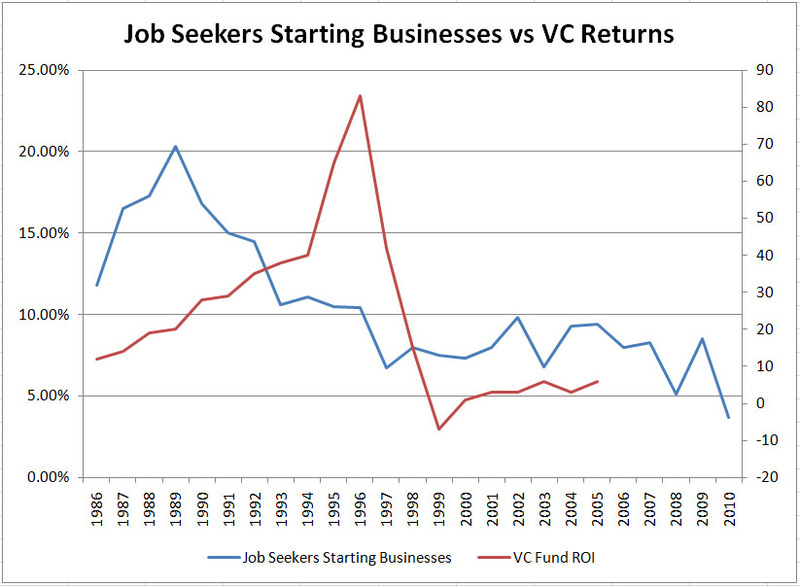 In their world, the VC’s get a few very large returns and a lot of no return at all. The big ones furnish the overall return and offset the failures of the others. What this means is that entrepreneurs can often experience a difference in goals and utility curves. For those that slept through the economics classes in college (actually, I found it pretty boring myself), a utility curve shows your willingness to accept risk in exchange for potential rewards. For the entrepreneur, this means keeping in mind that their VC’s are willing to accept a lot of risk for an extremely large reward. Sounds like the entrepreneur’s ideal, right? Well let’s assume that the reward is selling a company for over $40M just 10 months after its founding. Let’s further suggest that there are VC’s who will look at that and decide that well it is truly life changing money for the founders, it just isn’t interesting to them. They would want to keep playing the hand. BTW, if your investors are ready to bail at an early stage, it likely means they think something is about to go badly for you, not that they think it is a great price. Okay, so let’s get beyond VC motivations (make sure you understand that Utility Curve thingey and pack it away in the back of your brain! ), and talk about companies. Let’s just assume that the practical ramification of the Utility Curve idea is that unless your idea can be a Billion Dollar idea (he says in best imitation of Dr Evil), you’re not VC material. And if you’re not VC material, you’re also not Angel material. The latter have all the same issues that lead to their own Utility Curve problems, they just don’t have as deep a pockets or a name brand firm, so they get involved earlier in order to have a place at the table. After all, Venture Returns are not great historically, but to this day they’re not so terrible relative to the stock market. Mind you, the Angel will be much more tempted by the early acquisition exit, but until that presents itself, you need to operate like they are helping you down the road to getting VC. Okay, one more nuance for entrepreneurs. In the old days (geez, I hate saying that, but 5 startups later, I’ve got some war stories), VC’s used to sort opportunities into features, products, and markets. Time was, they wanted to invest in markets much more than products, and never in features. Sounds funny to think of something a company builds as a feature, but there are many startups that have built features. The problem is that whatever they are a feature of may wake up one day and decide they want to own that market. VC’s that ignored the rule learned, much to their chagrin, that despite great traction, when a company like Twitter starts to take the reins of its ecosystem, a few “feature companies” lose their value very suddenly. Think of the feature-product-market hierarchy as another way of seeking the Billion Dollar Idea. Hard for a feature to be worth a Billion, perhaps even impossible. Easier for a Product, but still not a lay-up. Uncovering an entirely new Market, though, is usually worth a Billion. Part of the Entrepreneur’s task is therefore to look at what they’ve got very objectively and figure out how to make it a Market. Never mind that you initially built a Feature. Can you apply that Feature to making a Market in some way? Why is your Big Idea not just an add-on to someone else’s Big Market and Big Product Suite? To some extent it is a game. All things can be bought. Larry Ellison doesn’t worry that Oracle isn’t far along on SaaS because he can buy every public SaaS company without too much trouble. So the other thing is not to be too dogmatic about the definitions. Markets turn into Products, and Products into Features if you don’t move fast enough. That’s called Consolidation. VC’s view Consolidation as inevitable. Your job is not to talk them out of it, it is to convince them why you have the most valuable gem in the Consolidation Crown, and perhaps even why you’ll be the one doing the Consolidation first. At the least, convince them why your idea is a Must Buy because there can be no alternatives. To a lot of entrepreneurs who have a Good Idea (notice I didn’t say a Big Idea), and just want to get on with it, the description I’ve given of the VC funded world sounds pretty scary. There’s a big agenda there and a lot of the bullet points weren’t even things the entrepreneur wanted to deal with. That’s okay. As one very successful VC told me, a lot of companies shouldn’t go for VC. Sometimes we lose perspective in Silicon Valley. Everything is not Venture Capital funded. In fact, the vast majority of small business gets by without a dime of VC. So again, ask yourself whether you really have the next Google-sized Big Idea, or whether you’re more comfortable with your very Good Idea. A Boostrapped Good Idea goes something like this. You get together with 2 or 3 other people (the number usually seems to be about that many). You work for a year to build your product. During this time you starve, either for money, because you aren’t getting paid, or for time, because you are doing it after hours while your Day Job feeds your family. You really can’t afford to starve for more than that year, so that puts some boundaries around what you can tackle. At the end of the year, the idea has to be immediately monetizable. You’ll spend the second year also starving, while you tune up your marketing, get the word out, and possible correct flaws in the product. By the end of the second year, if all goes well, you’re ready to quit your Day Job and never look back. There is actually a long list of companies that have followed exactly this plan and wound up very happy about it. Speaking of happy bootstrapping, Valley peeps often refer to these Good Ideas as “Lifestyle Businesses.” They say it like it’s a Bad Thing. What’s the worst that can happen with a “Lifestyle Business.” You work really hard for substandard pay and ultimately fail. Wait. That happens in VC deals too. Hmmm. What’s a happy scenario? You work really hard and build up your business until it is doing $20M a year and doubling each year with 12 employees. You own 100% of it, you have no debt or equity out (except to partners and employees who are in the same boat as you), you’re the master of your destiny, and you are loving life. $20M a year goes long way with 12 employees. So don’t say, “Lifestyle Business” like it’s a Bad Thing. It could be the best thing that ever happened to you. OTOH, that’s still not Jet Money, so if you absolutely positively must have that Gulfstream, you better get back to looking for a Big Idea. Here is the other strange thing about this brave new startup world: there really is no Middle Ground. Not only could none of the startups I’ve been in get funded the way they did back in the day, many of them were just not Big Ideas. There is a vast gulf between your $20M very-happy-thank-you-very-much bootstrap and the Billion Dollar Big Idea. I can point to all sorts of interesting software companies that made it to maybe $100 million in revenues, but that are in that vast middle ground. It turns out that those are untenable ideas in the current climate. That’s not good enough, and if you get a chance to build such a company, it will be because the investors thought it was a much Bigger Idea. You will be surprised to find out they think you fell short, even though you may even have gone public. Don’t ask me how I know. So ignore the Middle Ground. Don’t try to put lipstick on that pig and sell it as a Big Idea. Make sure you at least think you really do have a Big Idea. Otherwise, Bootstrap a Good Idea. – Software is cheaper to build. – Subscription models are alive and well, and an annuity is a much happier thing to bet your Boostrappa’s time on than a few big checks followed by crickets chirping. – It isn’t just software that is cheaper. If your audience is online, you can reach them with less cost and effort than ever before. – People who are not Bootstrappers can’t get capital to compete with you nearly as easily. They have to at least find a few token Bootstrappers to build a product and line up customers. – People with VC have to avoid the niches. Those are not Billion Dollar Big Ideas. But niches are a happy place for a pure Bootstrapper. Niches exist all the way up to $1 Billion and are there for the taking, if you have what it takes. – If you do have a Big Idea, you can get it to the stage where it is fundable much more easily than those who can’t bootstrap. Time was a successful exec from a Big Company with a name and a slide show could land a big VC check and go after your market without ever having to starve. I won’t say that no longer happens, but it is a whole lot less common. – If you have a Good Idea, very interesting businesses are being built today. Take a look at companies like 37Signals, SmugMug, and Atlassian. The latter grew all the way to $60M, at which point VC realized it really was a Big Idea, and Accel made the biggest investment they’ve ever made to get in. It’s interesting that the return spike follows almost exactly the right lag after company founding. Yes, Virginia, portfolios are a beautiful thing, and when you’re betting on the Billion Dollar Plus end of the utility curve, they benefit from having a lot more bets available to choose from. Meanwhile, despite a lot more unemployed, a lot fewer of them are choosing to start businesses. Bootstrappers: start now with little competition, and (hopefully) with a rising economy for some tailwind. I’ll be doing a series of posts on Boostrapping because, it’s a Bootstrappa’s Paradise. Hey, don’t take my word that it’s hard to raise money on a slideshow. Fred Wilson pretty much says so on his blog too. Chris Selland wonders whether it isn’t time for investors to target the Middle Ground in some way. I agree, and hate the thought of leaving it fallow. But until they do, entrepreneurs need to understand the rules of the game to win. Is the Open Stack Cloud Announcement a Big Deal? Open stack MIGHT be a big deal, it awaits adoption to see. In discussions with the Enterprise Irregulars, the question came up of whether it was a good analog to view Open Stack as the “Android” to Amazon’s “iPhone” (where is their antennagate?). This is an interesting metaphor as much for what it tells us about where it doesn’t fit as where it does. It is a good analog to Android in the sense it gives a lot of helpless hosters a shot at the Cloud much as Android gives helpless handset makers a shot. Similar to the Android, a lot still depends on how well the handset guys do their part, how many great apps wind up on the platform, and on how well the market likes the combined offerings. Substitute “hosters” for handset guys, and let the other two stand when talking about Open Stack. I can’t emphasize the point that there is more here than just the Cloud Software. This goes to the essence of Software as a Service. It isn’t just software, it’s the whole Service. In a related discussion, someone came out with the line that SAP ByD was “real but maybe not cost effective.” ByD has been plagued by delay and the company has said the delays where because the architecture could not be delivered for a low enough cost. Clearly SAP can write an ERP system. But just as clearly, a SaaS system that works, but is not cost effective is not a SaaS system at all because the service can’t be delivered. It’s the sound of one hand clapping. Yet, a lot of otherwise reasonable folks just can’t fathom that distinction. – Amazon will be at $1B (apparently critical mass for SaaS CRM) in the not too distant future. Can a competitor get it together and grow fast enough to keep that gap from going over $1B with Amazon? If $1B isn’t the danger zone, what is? How long did vendors like DEC let the IBM PC gain momentum before it was too late to catch them? How long did the PC have multiple operating systems before Microsoft’s advantage was too great? None of these are exact analogies, but there is a critical mass. If it is reached without meaningful competition, Amazon has won until the next paradigm shift and their opportunity to succumb to Innovator’s Dilemma. – Also unlike Android, it really isn’t clear why Open Stack is great. Open ain’t enough, particularly with a group arguing that Amazons APIs ought to be a standard and Amazon continuously innovating and cutting prices while many can’t seem to even get in the game. If the Amazon API is available from more than one vendor, it starts to be pretty open. Rackspace wants to spark up the “avoid lock-in by choosing us debate“, but pre-Open Stack, Rackspace was the one locking you in more than Amazon. I guess this is a great example of Jean Louis Gasee’s admonition that if you can’t fix it, feature it (great article on antennagate, BTW). Ironically, after I published the blog post on Amazon API’s becoming a standard, and hearing a great hue and cry about all the things it couldn’t do, Amazon launched a whole raft of new features. Cluster Compute Instances, in particular, offer the ability to couple servers in a low latency subnet for cluster computing. It’s pitched as being all about making Cray-Supercomputers-On-Demand available to all comers (some cool ideas about what I’d do with that! ), but ironically, the low latency is exactly what a lot of the detractors of Amazon-API-as-Standard said couldn’t be done. I know Amazon didn’t build it in response to my blog’s comments (LOL! ), but I chuckle at how it came out a couple days later and is focused on exactly the problem being complained about. BTW, sorry for the OT, but read this guy James Hamilton’s blog for lots of good scoop on scaling and data center architecture. Getting back to the Rackspace Open Stack announcement, there is a lot of nervousness in the Not-Amazon-But-Wanna-Be-Cloud-Kings herd. It’s understandable. Not much to point to for scale in the Cloud world but Amazon. Concerns that it may be running away with the show. Concerns that the early decision to wait for someone else to figure out the Cloud because we can always jump in if it looks real enough may have been a bad decision (that Innovator’s Dilemma is a B*atch to face!). There is an interesting post on GigaOm about VMWare looking ahead to the day when server virtualization might not matter because of Cloud Computing. That’s an ideal line of thought for VMWare CEO Paul Maritz. After all, his alma mater Microsoft was always worried back in the day about who might “Microsoft” them. Of course it happened anyway, multiple times and I personally think they did it to themselves by thinking of the problem as holding on to existing markets at all cost. Innovator’s Dilemma strikes again. Nevertheless, the herd is restless. You can smell the fear. Open Stack is a good response, at least it is something, and from a company that actually is in the Cloud. As I said in the beginning, it will be a function of how well the Kieretsu cooperate. Cloud Computing, like SaaS, is holistic. Barney partnerships can’t make it go. If the partners aren’t pretty darned good at working together, this announcement could simply turn out to be one of those frequent bits of “the enemy of my enemy…” desperation marriages of convenience we see so often. It’s all about how much wood they can get behind the new arrow. If I had to make a prediction, it isn’t a Big Deal for the Cloud. It will largely give the “Private Cloud” (which isn’t the Cloud, but that’s another post) new ammunition without affecting Amazon much at all. Bears close watching. Good times for customers in Cloud Computing–we love competition! Amazon Web Services: The De Facto Cloud API? Read a couple of posts last week that coalesced some thoughts I’d been having into this one. First was the fascinating rumor about a Google EC2 clone. Hat tip to High Scalability Blog for putting me on to this one. The second was James Urquhart’s musings about the desirability of the Amazon API’s as a standard. James and most of his commenters are worried that we might standardize on something that doesn’t have all the bells and whistles. Guess what guys, standards NEVER have all the bells and whistles. By the time people get done arguing about them and they get enough momentum and use to be more than just standards in name, the world has moved on. So what? If we waited for standards to be perfect, we’d would have none. The point of the standards is that they’re good enough to help reduce friction in areas where innovation at every turn is no longer desirable. Are we there yet with the Cloud? I think so. I’m not saying there is no innovation left to do–there is tons of it coming, and it’ll all be good. But, there is value at this stage in having a standard too. There has been a lot of success demonstrated with the Amazon Cloud from companies large and small. I would be curious to hear whether Amazon thinks their API should be a standard (and whether they’re prepared to give up some control in exchange), or whether they think it still has too much growing up to do. First, the wonderful thing about standards is there are so many to choose from. Just because we annoint Amazon as one such standard does not mean there can never be others that are completely different. It does not mean the standard can never have a superset or optional features to cover many of the cases Urquhart raises. And remember, there is still that period of making it into a standard during which it can be molded a bit before it settles in. Second, speaking of supersets, I think it is important to think about Cloud Standards as a layered model. I would definitely not put all of Amazon’s offerings into the standing. Perhaps just EC2, EBS, and S3. Note that S3 is spreading even more rapidly than EC2 as a de facto standard. These three seem pretty benign, reasonably abstract (meaning they don’t expose too much ugly detail about what goes on underneath), and reasonably proven. So what do we get for it? If the standard works and matters, we get a lot more vendors supporting the standard. That’s a good thing, and something I have to believe every Amazon Web Services client would very much like to see happen. The second thing we get is that some, but not all, of the innovators will quit trying to reinvent the wheel that is the Amazon layer (IaaS if you must use an ‘aaS name for it) and they will move on to other layers. Depending on how much more innovation you think that layer needs, this is a good thing. For those that think it is a bad thing, there is still time for someone with a better mousetrap to put it out there and show us. But what if making it a standard causes a ton of innovation around how to solve some of the problems like I/O bandwidth behind the scenes without affecting the API? Wouldn’t that be an excellent thing? Heck, I’d love to be able to add an “11” to the AWS I/O speed control, who wouldn’t? But time is a wasting. For whatever reasons, it seems like the other players are very late to the party relative to Amazon. If they wait too long, Amazon gets a de facto standard before the market has much leverage to pry loose some control. This is arguably what happened around the IBM PC, DOS, and Windows. BTW, you read that like its a bad thing, but it wasn’t. We accomplished a heck of a lot by not having to continue innovating over the bus, the BIOS, and so on. It just could’ve been a lot better if there hadn’t been so much control vested in Microsoft and IBM. As I write this, I wonder a little bit if players like Google really aren’t taking too long. Maybe AppEngine is the exact image of what they think the Cloud should look like, and the problem is the world just didn’t bite the way they have with AWS. Google could be saying, “Okay, we hear you, so we’ll do it your way now.” There has to be some reason they’d endorse S3 and potentially EC2. If Google’s ready to go there, why not the rest of us? Many VC’s and other practitioners of the Art of Startup view consolidation as a normal part of the evolution of a market. At first there are lots of companies founded in a space and lots of hype. Over time, a handful emerge as leaders. Once the handful is obviously head and shoulders above the rest, they start to have an unfair advantage. They get all the capital, they get the PR attention, and ultimately, they get the customers. Then the next round of consolidation hits as much larger companies introduce competitive functionality and their peers respond by acquiring the startups. Eloqua, Silverpop, True Influence, LeadLife, Infusionsoft, Genius.com, LeadForce1, Marketo, and Loopfuse. There are many more that are at least peripherally connected. This is a lot of players in a space, and they all wait with baited breath every Dreamforce to see whether Salesforce will announce they’re jumping into the market or whether they will acquire one of these players. That sort of thing undeniably signals that consolidation has begun with a vengeance. It’s a game of musical chairs and everyone knows the music has to stop at some point and there will be too few chairs. What got me started thinking again about this market is Loopfuse’s announcement of a free version of their product (same thing that got David Raab writing, it seems). They, along with a number of other players in the space, were customers of Helpstream’s, so I am pretty familiar with their offerings. Loopfuse has some very cool technology, and the idea of a free version is fascinating. Raab sees it as a clear sign of consolidation, but it got me thinking about the pricing and capabilities of this category in general. First, what does the software do? Lots of things, and the vendors will take me to task for over simplifying, but essentially, they manage your email marketing campaigns. They let you manage your list and send emails that direct people to your landing pages. These pages, often created with the Marketing Automation software and always managed by it, allow the prospect to sign up for something–a webinar, white paper, or downloadable demo, for example. In the process of signing up, they hand over information about themselves that goes into the database. SEO and PPC (pay per click) may also direct prospects to these pages, in which case you get new names to mail to. This whole mailing business starts a “drip feed” marketing campaign where your prospects get new information every so often to prod them along the buying cycle, a process called “lead nurturing.” FWIW, various sources I have read indicate it takes something like 7 mailings to convert someone to be ready to sell to. Lastly, they have a capability called “Lead Scoring” that attempts to monitor which leads are hotter based on how much content they have consumed and how proactive versus inactive they may be. The hope is that Lead Scoring can predict the magical moment when the customer is ready to buy and a sales person should reach out to them. Second, how are these companies differentiated? It gets harder and harder to tell over time, which is another consolidation signal. They all do the basics. There don’t seem to be any “killer features” separating one from another, and it has been a while since something new was introduced that really set one of the players above the others. Differentiation is starting to come from the market segments being targeted (that one is for bigger companies that need more features at some cost of ease of use, this one is for medium sized companies that need some of the power features but that have to hit the ground running quickly, and this third one is for small companies that need the cheap solution). Back to pricing, which has been interesting for the category. Many of the players have steadily worked at moving up-market. VC’s hate the SMB markets. They’ve lost a lot of money selling there, and they are frankly skeptical about the market. With some notable exceptions (Infusionsoft is totally dedicated to the low end), they don’t want to hear about it. So, these vendors pushed to get $10K annual deal sizes, then $15K, and so on. – I don’t have enough leads! – You don’t call the leads I give you! The need to integrate with SFA together with this back and forth, sure makes this category feel like a module on somebody’s suite rather than a category. Funny how SFA/CRM didn’t succumb to that. But worse, the pricing, the integration complexity, and the complexity of the user experience for most of these products makes for too much friction in the buying cycle. For what the products actually deliver, drip feed marketing, they are also really expensive. I’ve talked to a lot of smaller startups who really agonize over whether these products are worth their time. Larger firms wind up creating mini-orgs of consultants and others to keep the Marketing Automation engine running, but it’s just a piece of what they need to get done, and they want more. Marketing people in general have a hard time justifying their various investments, and a lot of folks just aren’t sure these products do the trick. They know they need to do some drip feed. That’s a given. They are very skeptical about Lead Scoring, and I confess, having worked with it, I am too. The salient question is whether a thirst for more collateral is a reliable indicator of who to talk to. The answer from all I talk to is that it helps, but is nowhere close to being a reliable indicator. For one thing, it can’t tell you whether there is a project and budget or not. For another, it can’t tell you whether the customer that isn’t asking for much content is not interested, or just feels underserved by the experience you’ve served up around content. In short, Lead Scoring doesn’t qualify the lead. Another thing I have seen is the desire by marketing departments to turn this software on and off as they go through the roller coaster of spending to get leads and then cutting back to work the leads. Many of the packages charge based on how large your database is, and many marketers are used to feast or famine budgeting. These packages need more functionality that benefits from being “always on” to offset that. If I look at what my vision for a Marketer’s Online Central Nervous System should be, today’s “Marketing Automation” falls way short. I use the quotes because it just doesn’t automate enough. This is ironic, since the category is badly in need of some more innovation to stave off consolidation. I will be writing more over time about that Marketer’s Online Central Nervous System (and hopefully I can get a better name! ), but let me give you the short form. At 100,000 feet, CRM is often described as providing a 360 degree view of the customer. From that perspective, Marketing Automation should provide a 360 degree of the Lead (a lead is totally in Marketing’s hands) and Prospects (a prospect is in both Marketing’s and Sales’ hands). – “Widget” marketing via mobile or otherwise. Are you starting to get the picture? The lead funnel needs to be extended both earlier, later, and to cover the whole breadth of the funnel and not just what’s happening around email and landing pages. To realize all that is a big vision, but isn’t it a necessary vision, whether you’re talking about consolidation, competition, or just what “Marketing Automation” should really mean? C’mon guys, there is more to Marketing than a Landing Page! Thanks to Techmeme, I just read Andy Grove’s post about job creation in the US, entitled, “How to Make an American Job Before It’s Too Late.” While there’s some goodness in the story, I have to say that just as Andy left the restaurant unsettled, I left from reading his post unsettled. 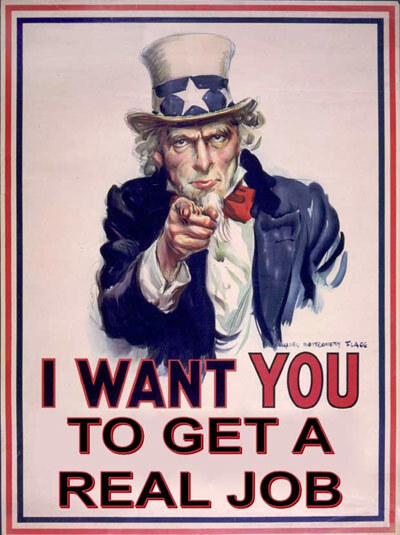 While I generally avoid politics, the good old American holiday of Fourth of July is coming, so this is a good nationalistic discussion to have: what to do about creating more jobs in America? We sure do need a lot more of them. It’s our own misplaced faith in the power of startups to create U.S. jobs. Americans love the idea of the guys in the garage inventing something that changes the world. New York Times columnist Thomas L. Friedman recently encapsulated this view in a piece called “Start-Ups, Not Bailouts.” His argument: Let tired old companies that do commodity manufacturing die if they have to. If Washington really wants to create jobs, he wrote, it should back startups. Friedman is wrong. Startups are a wonderful thing, but they cannot by themselves increase tech employment. 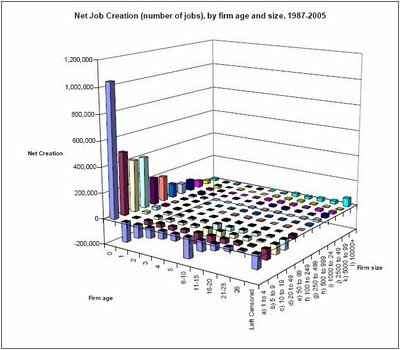 The columns represent net job creation. The big giant spike that’s doing most of the work is for new companies with less than 50 employees. A little deeper analysis is available here, and goes back all the way to a study published in 1979 before we were so worried about the impact of China on the job market. The OECD has a particularly in-depth white paper on how public policy impacts the small firms that are the drivers of growth. There are many other such write ups. Sorry, Andy, it doesn’t look like Intel and companies like it are the engines of job creation in America, much as we love to admire them. We should develop a system of financial incentives: Levy an extra tax on the product of offshored labor. (If the result is a trade war, treat it like other wars — fight to win.) Keep that money separate. Deposit it in the coffers of what we might call the Scaling Bank of the U.S. and make these sums available to companies that will scale their American operations. My problem with this is a simple one: Just as Grove mistakes the ability of large centrally run corporations to create jobs and do well by the worker, he also mistakes the ability of a large centrally-run government to do well by the worker and create jobs using tax policies. Isn’t it ironic that small and decentralized is so much more efficient than big and monolithic? Isn’t that the real lesson of Silicon Valley, rather than the Intels of the Valley? Isn’t it also the real lesson of the American way where individual voters and capitalists decentralize government and business? These policies he advocates will, as Grove points out, largely serve the interests of the Big Companies (those who are “scaling out”) who weren’t the job growth drivers even before all this manufacturing outsourcing had taken such root. Today, not only are they not job growth drivers, they’re net job exporters. Moreover, what role did Grove play in doing his own outsourcing at Intel? They were busy building multi-billion dollar chip fabs while he was CEO until 2005. Did they all get built here in America? Aren’t you late to this party and didn’t you have a hand in some of the problems you’re raising? Now as I said, there are some things to like about the article. I do agree with Grove, particularly in the economic situation we find ourselves in, that as he puts it, “Job creation must be the No. 1 objective of state economic policy.” Unemployment in this country has reached ridiculous proportions, and the primary thing we seem to be doing about it is giving people government jobs and projects to work on. The predictions on what happens to the jobless rate when the temporary census workers go back to being unemployed are scary. BTW, how long exactly will it take businesses to build the giant new plants here at home needed to get back out from under those taxes? Can we really afford to wait that long? And how efficiently will whatever agency administers this plan be at not handing it over to cronies as a rich new source of high pork-content budget dollars? If you want to talk stimulus and public policy, why aren’t we empowering the small businesses that really are the Engines of Job Creation? Come to that, what has been the problem with Silicon Valley lately, and what role has public policy played in that? Well, let’s start with the VC’s. They can’t get a decent return on their funds. As Fred Wilson puts it, IPO’s just aren’t what they used to be. Because of Sarbanes Oxley and other regulations, it’s much harder for small companies to get to IPO’able size. Because of the excesses of the Dot Com boom, investors are a lot more skeptical about these IPO’s. In fact, the OECD white paper I mentioned earlier talks about regulatory overhead as being a key issue for small companies. To put it simply, they just don’t have the margin to deal with the extra overhead. Yet, SOX and other regulations want to treat them just like the Big Players. Why are we fettering the little guy instead of encouraging him? SOX and all the other regulatory changes meant to curb a few excesses like Enron (which BTW, was WAY larger than any tech startup when they caused their problems) have slammed the lowest common denominator. And, unless I am sadly confused, Wall Street just found another novel way of crashing the economy. Andy, if you want to create a real plan for action, get rid of all the red tape Washington puts our small business through. Put your tax credit scheme into effect, but instead of giving those credits to Big Companies for building plants here, give them in the form of tax breaks for the little guys. That’s right, slash what they pay, give them cash incentives to hire, and make the Big Guys who outsourced pay for it all so we don’t drive the National Debt any higher. Hey, who knows? With a positive enough environment for small business, maybe some will wind up being the next Intels and you can get some of that scaling out going on too! The iPhone antenna drama has just reached the stage of sublime comedy. Apparently, they’re now admitting their algorithm for calculating how many bars to show has been wrong since the beginning. They’ll be revising the software so that you see fewer bars most of the time. I have a bunch of friends with non-iPhones who hate their AT&T service too, but you know somewhere there is an AT&T guy who thinks there service is great and its just that the iPhone has never had a decent antenna and can’t properly figure how many bars its got. Meanwhile, Daring Fireball has a hilarious translation of Apple PR speak to normal English. Reading that reminded me of another hilarious piece I’m reading called, “Sh*t My Dad Says.” Now there’s a Follow Friday pick! These are work inappropriate not because of pictures, but because you’ll be laughing so hard they’ll know you’re not getting anything done.